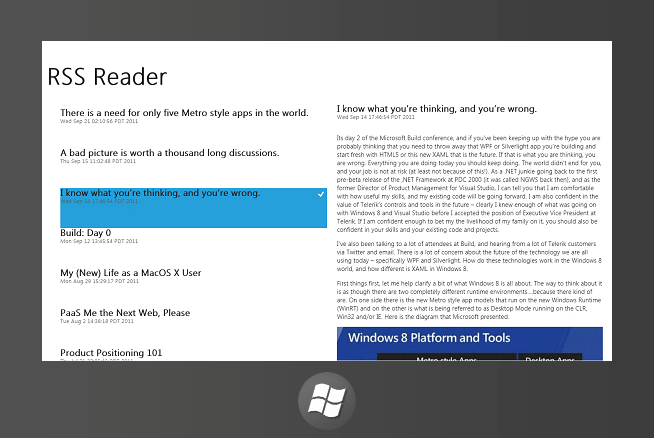 Previous Post There is a need for only five Metro style apps in the world. Just curious, why no discussion of C++ on WinRT? One of my left-over unresolved issues from BUILD is the question of whether or not we are regressing back to dominantly an unmanaged environment for Win8 and beyond. Is there any indication that this might be the case? Nothing about WinRT makes that untrue. HTML5+JS apps will run on a myriad of platforms. As an analogy, C++ is a portable language, but it’s very easy to write unportable C++.